Toyota Motor Sales, USA, Inc. (TMS, also known as Toyota USA) is the North American Toyota sales, marketing, and distribution subsidiary devoted to the United States market. Founded in 1957 in California, TMS currently employs more than 6,500 people. As of Spring 2017 Toyota moved to a new campus in Plano, TX. Construction of this new facility began in the fall of 2014, and is located at the corner of Texas State Highway 121 and Legacy Drive, across the street from the FedEx Office Headquarters, and the J. C. Penney World Headquarters. The former location of Toyota's headquarters was Torrance, California, where they supervised 14 regional offices. In 2014 Toyota announced it was moving its United States headquarters to Plano, Texas in the Dallas-Fort Worth area. The new headquarters will have around 4,000 total employees, including about 2,000 employees from the current headquarters and 1,000 employees from Toyota Financial Services, which also was in Torrance. The company plans to permanently move most employees by the time of completion of the new headquarters, late 2016 or early 2017, while initially the company will open a temporary office in Texas and move small groups of employees there in the interim. The administration of the Dallas Japanese School, the supplementary Japanese school serving Japanese citizen and Japanese American children living in the DFW area, stated that it expected to receive an additional 150 students due to the headquarters move. On Tuesday April 29, 2014, Mayor of Dallas Mike Rawlings stated that Toyota had considered moving the US offices to the City of Dallas but decided against it due to the quality of the Dallas Independent School District (DISD). A spokesperson of Toyota stated that the company, when deciding where to relocate, considered higher education, K-12 schools, access to the airport, and cost of living. The spokesperson did not say which cities other than Plano were being considered. In response to the move, the mayor of Torrance, Frank Scotto, stated that he was "very disappointed" by the decision. Matthew Haag of The Dallas Morning News stated that Toyota may have moved its headquarters to suburban Plano because of its similarities to Torrance, another suburban city. The company formerly maintained its headquarters in Torrance, California in Greater Los Angeles. The campus has six buildings, with a total of 2,000,000 square feet (190,000 m2) of office space. In 2012 a 1.1 megawatt hydrogen fuel cell generator was installed at the campus, giving half of the power for the six buildings during the peak demand period. The generator does not generate emissions. By using the generator, as of 2012 the company saves $130,000 in utility bill charges. As of 2014 the headquarters has 5,300 employees. On October 31, 1957, Toyota opened its first United States office in a former Rambler/Ford dealership, at 6000 Hollywood Blvd. As of April 2014 that building is still a Toyota dealership. Because the city had airline access to Tokyo and because of the proximity to the Port of Los Angeles the US division of Toyota located its headquarters in the Los Angeles area. 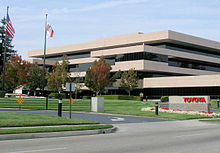 The Torrance headquarters opened in 1982. In 2003 the Toyota South Campus in Torrance received the Golden Nugget Award. Toyota Motor Sales USA and Gulf States Toyota Distributors hold the naming rights to Toyota Center. ^ a b c d e Hirsch, Jerry and David Undercoffler. "Toyota to move jobs and marketing headquarters from Torrance to Texas." Los Angeles Times. April 27, 2014. Retrieved on April 29, 2014. ^ a b Artsy, Avishay. "Torrance mayor ‘very disappointed’ Toyota is moving jobs to Texas" (Archive). KCRW. April 28, 2014. Retrieved on April 30, 2014. ^ "Toyota's move to North Texas brings more interest in Japanese schooling" (Archive). WFAA-TV. June 26, 2014. Retrieved on April 10, 2015. ^ Haag, Matthew. "Mayor Mike Rawlings: Toyota didn’t move to Dallas because of DISD." The Dallas Morning News. April 29, 2014. Retrieved on April 30, 2014. ^ a b Hirsch, Jerry. "Giant new Toyota fuel cell powers buildings rather than cars." Los Angeles Times. October 21, 2012. Retrieved on May 11, 2013. ^ "'Possibly the Most Successful Hollywood Opening of 1957' - Park Labrea News/ Beverly Press". beverlypress.com. 5 May 2011. Retrieved 20 April 2018. ^ "Toyota Headquarters South Campus Expansion." (Archive) Turner Construction. Retrieved on May 23, 2013. This page was last edited on 20 April 2019, at 13:49 (UTC).